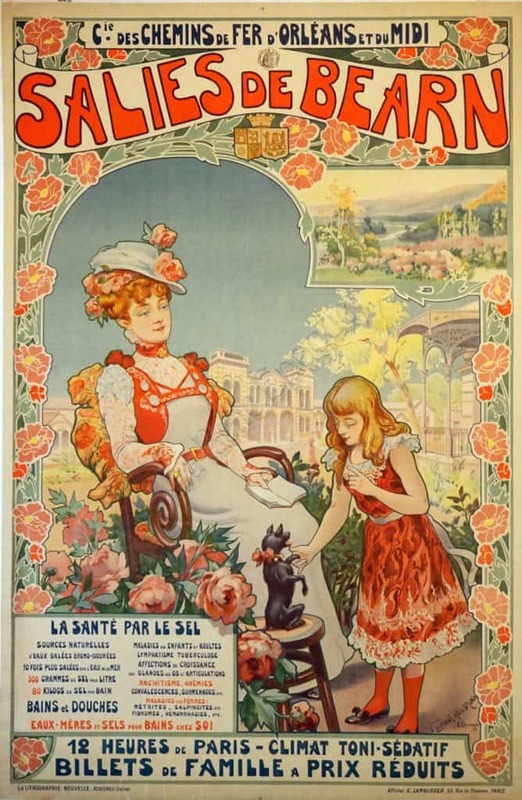 A travel poster by Chemin de fer d’Orlean at du Midi to Salies de Bearn. This was a resort area in Southwestern France (Pyrenees Area) along the Atlantic Ocean. Known for their Salt Water Baths (spa) for various health benefits. The poster represents the height of Art Nouveau. Pictured is a Mother & Child with their pet enjoying a sunny day in the garden. To the right is a gazebo, and to the back are the gorgeous mountains.